Home / -Touring- / Midge Ure / Paul Young / Touring / Ultravox / Touring: Midge Ure and Paul Young Co-Headlining U.S. "The Soundtrack of Your Life Tour"
Touring: Midge Ure and Paul Young Co-Headlining U.S. "The Soundtrack of Your Life Tour"
Grammy and Brit Award winning musician Midge Ure returns to North America this summer on a co-headline tour with old friend, and fellow Brit, Paul Young. The first leg of the 'Soundtrack of Your Life' Tour will hit Texas, the Midwest and Northeast with more to be announced including a second leg hitting the west coast in August. Midge Ure will be performing Ultravox, Visage and solo material as well as playing songs from his highly acclaimed album Fragile, released in 2014. There are a handful of solo acoustic dates for Midge but the rest of the tour is very much plugged in, featuring Ure on electric guitar and synthesizer recalling the groundbreaking, innovative sound he is known for. Ure also recently released an album of orchestrated versions of Ultravox hits and Midge Ure classics including 'Vienna', 'Dancing with Tears in My Eyes', and 'If I Was' via BMG on December 1. Paul Young will be performing songs from his chart topping catalog spanning 4 decades including the smash hits "Come Back & Stay" "Every Time You Go Away." and, "What Becomes Of The Broken Hearted" as well as tracks from his latest album Good Times, released in 2016. Midge Ure has an impressive back catalog fronting the groundbreaking electrorock band Ultravox as well as being a member of such notable bands as Visage and Thin Lizzy in addition to Band Aid where he produced and co wrote the smash charity single "Do They Know Its Christmas." He was also one of the principle creators of Live Aid and Live 8 along with Bob Geldof. 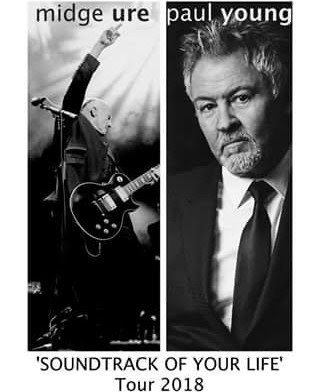 Ure has spent most of his career touring the globe most recently with Ultravox who reformed in 2009 as well as some solo shows and the notable role of MD for the Princes Trust at the Royal Albert Hall with a cast of the usual suspects including Queen, Eric Clapton, Phil Collins and Mark King. Paul Young burst onto the UK music scene with his first UK number one in 1983 with "Wherever I Lay My Hat." His 1993 debut album "No Parlez" went straight to the top of the album charts, eventually reaching quadruple Platinum with the smash single releases "Love Of The Common People" and "Come Back & Stay." Paul sang on Band-Aid's historic "Do They Know It's Christmas", famously opening the song with its first lines. This charity single spawned the never-to-be-repeated worldwide concert Live Aid in 1985. That same year, Paul's UK chart topping second album, The Secret of Association consolidated his success worldwide with a number one Billboard Chart single in the USA, "Every Time You Go Away." In 1990, the LP Other Voices, had a U.S. number one Adult Contemporary hit with "Oh Girl", to be followed in 1992 with another U.S. number one Adult Contemporary hit with "What Becomes Of The Broken Hearted" from the movie Fried Green Tomatoes. Paul has collaborated and sung over the years with many artists such as Dave Gilmour, Steve Winwood, Paul Carrack, Bobby Womack, Billy Joel, Chaka Khan, Clannad, and the hits continued in the 90's with a collaborative number one European hit with Italian artist Zucchero, "Senza Una Donna", and the solo hit "Now I Know What Made Otis Blue". 2016 Saw the release of Paul's latest album release "Good Times" on the UK label New State.